Are you looking for the best Hudson Valley wedding photographer? That’s a pretty broad question. What do you mean by the best? One who makes carefully crafted photos that require hours of posing? Or perhaps you’re looking for a Hudson Valley wedding photojournalist, who can shoot great portrait and group photos but spends most of their day documenting the real things that go on at a wedding. As a Hudson valley wedding photojournalist, my approach to weddings is a little different. I will certainly shoot group and family photos. But the majority of my day working at a place like Mohonk Mountain House wedding in New Paltz will be spent looking for the little moments, the emotions, which tell the story of your wedding day. Take this woodland trail wedding photo. 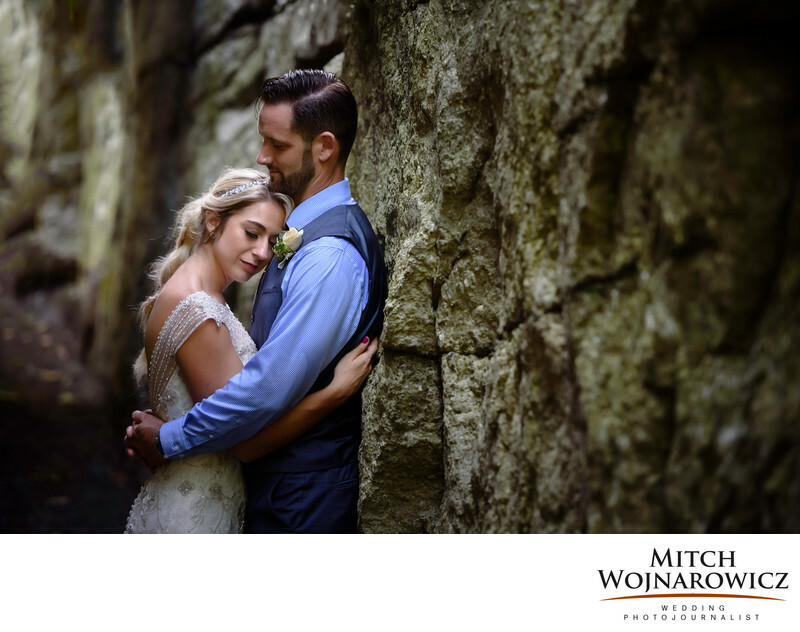 This couple wanted to spend some time on the trails and in the rocks surrounding the Mohonk Mountain House. Before their wedding reception, we took a little bit of time alone and walked around the extensive grounds, looking for spots where I could gently coach them, letting real emotional moments arise which would create great wedding portraits of the couple. As one of the best Hudson Valley wedding photographers, I know how to allow a couple to live in the moment on their wedding day. It is important in the rush of a wedding to help a couple find the little bits of quiet time. This allows them to bond and to disconnect from the rush and stress of a typical wedding. But, this doesn’t mean that I stay hidden in a corner, waiting and hoping for something to happen in front of me. Sure, I can react to those moments and can capture them effortlessly. After all, I have decades of experience doing this. With extensive pre-planning, we’ll know what we are going to do and when. Then, there are times where I’ll give simple direction. And other times I’ll give more concrete guidance. Any way you look at it, I’ll make you look relaxed, like “yourself” and guarantee you will look your best in your wedding photos. There are so many beautiful locations for a wedding in the Hudson Valley. And there are so many great locations for wedding photos at Mohonk Mountain House. Let’s explore some of them together at your New Paltz wedding. Keywords: hudson valley (24), Mohonk Mountain House (3).